In August 1993 a British magazine, Game Zone, printed reviews of 2 games. But were they unreleased, or did they simply never exist at all? For some time now I’ve wanted to draw people’s attention to this issue of Game Zone, an old, unofficial, Nintendo-themed magazine by a now defunct British publisher whose name escapes me. It represents either a case of 2 games which were completed, sent out in prototype form for review purposes, and then never released – in which case there could still be prototype cartridges to discover. Or it’s a rather cheeky joke and the games are fictional. For a bit of context, Game Zone’s editor was Jackie Ryan, a woman who previously helmed some ZX Spectrum magazine I forget the name of, loved for its irreverent humour, and GZ followed this trend by being surreal, sarcastic, and generally a bit weird. Very British, you could argue. It was all a bit silly at times, which is what makes me think these 2 games never existed. The reviews themselves are the standard early 1990s GZ fare. One tip-off is the screenshots. Normally GZ had some good quality screens, but these are blurry, pixelated and indistinct, encouraging the idea that they were faked. Oh, and both games receive the exact same score: 78%. What confuses the matter is the August publication date, meaning it was likely on sale in July, and had been written during the month of June, and was therefore far removed from any April fool’s joke,. Click the pics to see an enlarged version which you can read. 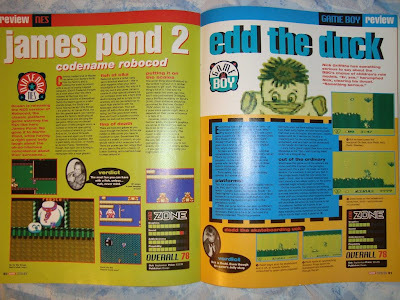 The James Pond 2: Codename Robocod on NES review actually had me convinced for a long time, since the game does exist and was ported from the Amiga to the SNES, Genesis, PS1, GBA, and several other systems. I think there was even a GB version. So a NES port would not be out of the question. No NES ROM archive features information on it, and neither does trawling the internet. If anywhere else has given mention to James Pond 2 on the NES, I’ve not heard it. So, unreleased prototype, or fictional game? I’ve no idea what happened to Martin Pond, the reviewer, but I’ve not seen his work printed anywhere since GZ, otherwise I’d say it’s worth contacting him. Edd the Duck was apparently a children’s mascot of the British Broadcasting Corporation (from about 1 minute). Before my time, so I’ve never seen it. There was apparently a licensed Edd the Duck game released, but for the ZX Spectrum, Amstrad and Amiga home computers. Which, given GZ’s connection to the Spectrum, convinces me that this was likely some kind of surreal joke. The review itself is chock full of weirdness, at one point comparing it to Sonic the Hedgehog, and the screenshots don’t match up with each other. One doesn’t have any hearts, and in the others, there’s no number next to the white square. The reviewer, Nick Griffiths, went on to write for the Daily Mail’s Weekend magazine supplement, doing the film reviews – which I suppose makes him vaguely contactable. EDIT: Googling his name makes me think he may in fact be this author. Do any readers have any insight into this strange matter? Can anyone claim to have played or seen either of these games? Do they exist, are there prototypes somewhere, or was it all a surreal joke? I've found a torrent GB games collection that (apparently) features "Edd the duck". There's a difference in pubblisher, although, whereas review states "Beam" and torrent "Zeppelin Games"
All I found was a flikr page with some more screenshots.. I think from the same magazine though. I have a few issues of Game Zone (the multiformat version that did Sega, Lynx and PC-Engine stuff as well), and still find it a fun read to this day. Here's a complete list of GB titles ca. 1994. According to it, Edd the Duck was published by "Laserbeam"
I downloaded one of the torrents that claims to have Edd the Duck in it (http://www.torrentdownloads.net/torrent/388518/Nintendo+GameBoy+620+Roms+plus+Emulator+H33T+1981CamaroZ28), and, guess what, no Edd. According to GameFAQ Laserbeam Entertainment produced two games for Game Boy: "Baby T-rex" and "Bamse". I've done a quick search for this games and guess what...? Bamse and Baby T-rex are the same games, only with characters sprites changed (i guess Bamse was known only in Sweden.....). Aaaaaand, the games sprites looks awfully similar to those pubblished in GZ, referring to "Edd the duck". Thanks for posting a link to that Flickr page. I'm pleased to see someone else has taken an interest in it. The page says it's from NMS magazine, so if more than one magazine covered it, then it probably was planned. Perhaps the publisher had sent screens for preview purposes and, having played the SNES version, they decided to "create" a review without the game. I dunno. The Edd the Duck thing still puzzles me though, being listed but not existing. Technically Edd might not be before my time, but I only moved to the UK after he stopped being shown on TV... I think. I never saw him anyway. Hello I'm Nick the reviewer of Edd the Duck! (Honestly.) Can't say I remember anything about the game, however I wouldn't have made it all up so some sort of prototype cart must have existed. Perhaps the timing was poor and Edd's strange controller, Andi Peters, quit the Broom Cupboard (you had to be there) and the character was no longer deemed "hip" (you had to be there). As for Martin Pond - lovely chap - I seem to recall he disappeared into the games industry, working for one of the manufacturers. Wow, hello! Thank you for posting - I didn't expect the original authors to stop by. Other magazines have invented games as a joke, plus I couldn't find any info anywhere else, so I'd assumed that's what happened here. This might be something for the archivers to start hunting for in that case - they love tracking down unreleased prototypes. This must be quite a blast from the past for you. I now feel a bit bad for being so critical of what is a 17-year-old publication. What are your memories of it? As a former games journo I can say that nowadays it involves long hours, hard work for very little pay, under sometimes unpleasant management, with some very unethical business practices. Not nice at all. I did a search for Martin Pond, it seems he writes scripts for games these days. 17 years ago?! Jesus. It feels like yesterday etc. I loved Game Zone and Sega Zone - they had some very funny writers (Duncan McDonald, Patrick McCarthy, Paul Lakin et al - ooh, and Jane Goldman, Jonathan Ross's wife) and you could write whatever you wanted, nothing was deemed too stupid. I remember writing a review of Spiderman as a Swedish person and having him describe global warming as "Hole in sky make the birds heat up". How I (alone) laughed. But I have only fond memories of those times - reasonable pay, free games, being paid to play - until of course the mags folded. Everything good must come to an end. It's a Beam/Laserbeam Game alrighty. For some reason Edd was not released (It was timing or Liciencing) and Baby T-rex was thrown together in about a week to meet a contractual agreement after Edd Fell thru. We're Back was hacked 4 times if you Count Edd. We're Back (Original US), Bamse (Sweeden), Edd The Duck (UK Unreleased), Agro Soar (Australia) and baby T-rex (Europe). Unfortunitly I can claim that I helped program this. Wow Nick! =) Great to see you online, ^_^. I'm a huge GameZone fan, and made a fanzine that tried to replicate the Cartridge Family, with a "Comedy antics of the team" page, but it wasn't as funny, naturally, ;-). Have touched base with Tim Ponting, Macca, and briefly met Whistlin' Rick Wilson a few times at E3, ^_^. Would love to hear what you're up to these days, ^_^. I have no valuable information, but was a great piece to read some more obscure NES trivia/history/stuff -- and quite a bonus to see an original writer visit the post!! Just found this thread, probably nobody interested now, but just to set the record straight. I'm not sure who anonymous is that claims they helped program these, maybe tools or something, as I was the coder that did all these at Beam. Baby T-Rex wasn't thrown together in about a week as that was the original game made based on a character thought up by Alfred Milgroms' son and developed simultaneously on multiple formats. I remember listening to that same title theme from Marshall Parker for months on end, it's still ingrained in my memory. After an agreement with Jamie Dunn we then changed the character to Agro for release in Australia, with We're Back and Bamse to follow, and definitely Edd The Duck. It was approved by Nintendo ready for sale, and I'm pretty certain it went out to sale. I still have the source code and roms for all those games somewhere in my archive. FYI it was later altered for Taz-mania, though that was more than just the main sprites, but still most of the Baby T-Rex base was there. I know this is quite a while ago and probably nobody interested now, but just to set the record straight. I'm not sure who anonymous is, unless they worked on tools or not the GB version as I coded all those games for GB. Baby T-Rex was the original and not thrown together in a few weeks. We developed that at Beam on multiple formats after the character was thought up by Alfred Milgroms' son. We spent months on that - I still have that title tune written by Marshall Parker ingrained in my memory. It was then altered for the Australian market as Agro Soar after an agreement with Jamie Dunn, then Bamse, We're Back and Edd the Duck. Edd was approved by Nintendo and I always thought went on sale. I still have the source code and roms in my archive somewhere. FYI it was also used to make Taz-mania for GB, a little more than just the sprites were changed, though still mostly Baby T-Rex. Hi David, thank you for sharing your memories. In GB Action Magazine 16 (Sept 1993) Edd the Duck was tested with overall 77 %. Information about Release Date: out September. I would be very interested in the fact why the game wasn't released effectively. Greetings from Germany. Just to clarify, did you work on just Ed the Duck, or also James Pond for NES? If James Pond, any chance of releasing the ROM for that? I've just stumbled across this article because I've bought a lot of old magazines, including this particular issue. Issue 8 of Nintendo Game Zone is also of interest. Theymention the following unreleased games for NES: Dennis, Dr. Franken 2, Humans, Madness, Super James Pond and Zool. I also have an old issue of the Dutch Club Nintendo Extra which mentions "Asterix & Obelix" for NES. The NES version of Robocod was also reviewed in Nintendo Magazine System, issue 8. On the back of issue #10 of Nintendo Magazine System is an advertisement for Super James Pond. In the bottom left corner it lists the Super NES, the NES and Game Boy as the systems.